You may remember I reviewed Fairy Tale Comics early this year. Nursery Rhyme Comics is just as fascinating; just as much fun. Published by First Second books, and edited by Chris Duffy, it features the work of 50 cartoonists and illustrators. Kids will find loved nursery rhymes and new ones inside. They’ll also find slight variations on old favourites. Was there ever a more peculiar spider than the one who sat next to Miss Muffett? No wonder she ran off screaming! I predict children will adore the use of humour in so many rhymes. For instance, here are tiny details that made me laugh: In Old Mother Hubbard by J. Crane, in the final panel when the dog is buried, there’s a bone-shaped monument in the graveyard with the vertical inscription, “Dear Dog”. In Little Boy Blue, while the boy himself is sleeping, the farmyard animals are playing cards and one of the sheep is cheating! It’s absolutely fascinating to absorb all the different styles of illustrations and think about why a particular style or perspective was chosen. I truly believe this book should be in every library! Why? Kids who are visually oriented will adore the illustrations. They’ll appreciate seeing how each creator puts an individual stamp on his work, and interprets a nursery rhyme. (See more page examples at Macmillan.) Children who struggle with reading can borrow this book, and experience success with it. Because they’ve grown up in our culture, many of the rhymes will be familiar to them, allowing them to predict the text. Of course, the illustrated panels help too. It’s also a great book for children to share and read collaboratively. Teachers will appreciate what it offers for helping kids develop visual literacy skills. If you’re a parent who wants a nursery rhyme collection for your kids, do consider this one as it can be shared with younger kids, but also appreciated over and over again as children grow. Lots of libraries and school libraries have fairy tale and nursery rhyme resources, and this book makes an excellent choice for such a collection. 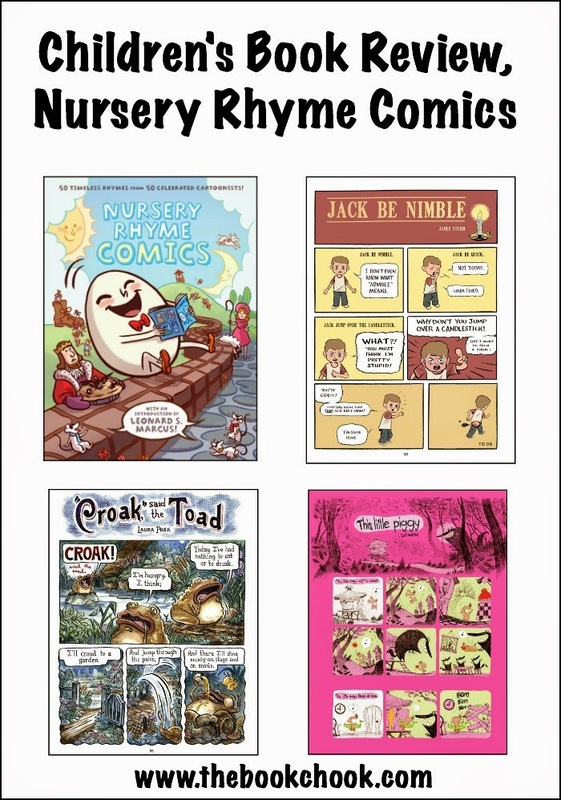 What fun for children to use Nursery Rhyme Comics as a model for their own interpretations of loved rhymes! You might also like to check out Let’s Celebrate Fairy Tale Day, and Let’s Use Chants and Rhymes with Kids. I love comics! This looks great!